The first time you run Mixxx, you may see an error message about the program not being able to open the default audio device on the system (see Figure 8-4). Figure 8-4. Mixxx tries to open the first sound card on the system by default, but this doesn't always work. On Ubuntu GNU/Linux in particular, the PulseAudio sound server can prevent Mixxx from getting direct access to the soundcard. 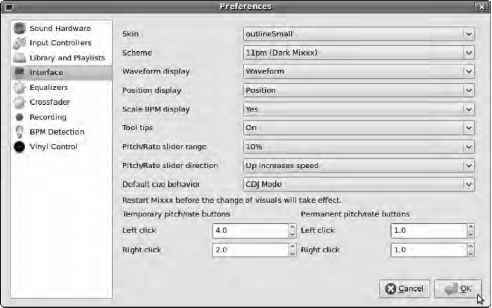 To correct this problem, go to Options > Preferences on the main menu bar of Mixxx, and, in the Sound Hardware tab, set Audio Output Master to pulse. Click OK, and the warning dialog goes away. However, using PulseAudio this way does seem to add extra latency, or delay, to the sound output, so I recommend that you uninstall the pulseaudio package for best results with Mixxx. You can remove packages by choosing System > Administration > Synaptic Package Manager. Use the quick search box in Synaptic to locate the pulseaudio package, right-click it, and select Mark for Removal. Then, click the Apply button on the Synaptic main toolbar. You may need to reboot your computer after this step in order to get the audio system working correctly. If you aren't running Ubuntu or PulseAudio, it may be that the first sound card in your system only supports 48000Hz sample rates. This is common with on-board sound chipsets and generic USB audio devices. By default, the output of Mixxx is set to 44100Hz, the sample rate of an audio CD, which is a sensible rate if your material is mostly copied from CDs. If your sound card refuses to open at the 44100Hz rate, you see the same error, but it's easily fixed. 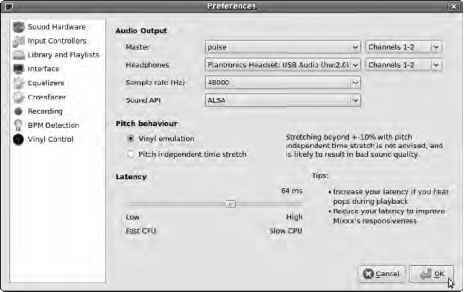 if the Preferences dialog box isn't open already, choose Options > Preferences > Sound Hardware, and set "Sample rate (Hz)" to 48000 (see Figure 8-5). Then, click OK to close the dialog. Figure 8-5. Correct setting of output sample rate avoids sound-card troubles. In common with Blender, which you read about in Chapter 6, Mixxx uses OpenGL to draw its interface, specifically the waveforms of the audio files. If your PC's or laptop's video card isn't set up for the hardware-accelerated Direct Rendering Infrastructure (DRI), Mixxx warns you on startup that performance will suffer and that you should set Preferences > Interface > "Waveform display" to Simple. Although this setting improves performance on machines without decent OpenGL capabilities, it means losing the ability to check the alignment of your beats by eye. Unless you're already a skilled turntablist with a well-tuned ear, this feature is extremely useful (see Figure 8-6). Figure 8-6. Mixxx's waveform display is so useful that accelerated video is well worth the upgrade. NVIDIA card—but be careful about noisy, whining cooling fans, which can be a distraction in the creative studio. On GNU/Linux, if you're running a compositing window manager such as Compiz, you may notice that Mixxx's waveform display appears to float on top of all other windows. This is because 3D desktops like Compiz are poorly integrated with OpenGL, at least in the package versions in current mainstream distros. 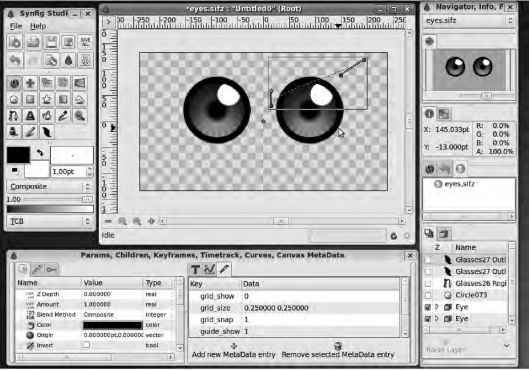 The simplest workaround is to switch back to a 2D window manager, such as Metacity, when running Mixxx (see Figure 8-7). Figure 8-7. Disable Compiz if you see strange effects when running Mixxx on Ubuntu. If you're running Mixxx in full-screen mode (Options > Full Screen), you won't notice the window manager anyway. 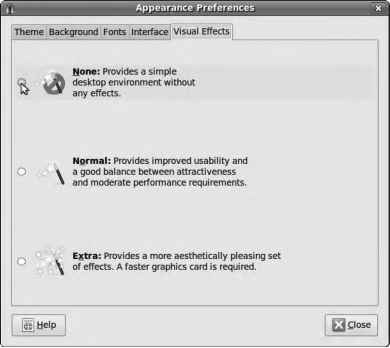 To fix this on Ubuntu, select System > Preferences > Appearance from the main GNOME toolbar, click the Visual Effects tab, and click the None radio button. Back in Mixxx, choose Options > Preferences > Interface > Skin to select a GUI that fits the display you're using. Figure 8-6 shows the default outlineSmall skin, which works on most sizes of screens. Other skins work more or less the same way, although the layout of the controls can be different. Figure 8-8. In the Preferences window, select a skin that fits your display and suits your mixing style.